A few days before New Year's, Ted and I went to the Rock and Roll Hall of Fame annex in SoHo. I'm glad I went before it closed its doors for good on January 3rd. I had been putting off going because the tickets were so damn expensive - $28.85! I felt I could only justify it by going with Ted, who I usually only see once a year. That, and that a portion of the admission went to Spirit Foundations (a charitable foundation set up by John Lennon and Yoko Ono). It was a fun place... a small tribute to rock n' roll. 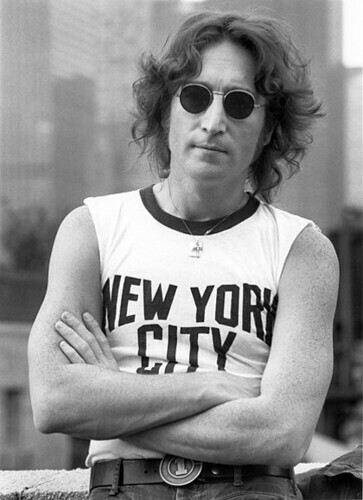 I really wanted to see "John Lennon: The New York City Years," however, because I'm a huge Beatles fan. I was only 10 when Lennon was killed, but I will never forget the moment I heard the news. 2. All the pages of handwritten lyrics I was able to look at, for songs like "Woman," "(Just Like) Starting Over," and of course "Imagine." 3. Looking at his pen and ink drawings and collages he made. I didn't even know he made collages as gifts for people. On display were collages John made for Ringo Starr and George Harrison. 4. The bloodstained glasses he wore on the last day of his life. And the capper, the bag containing the clothing he wore December 8, 1980 when he died. His widow, Yoko Ono, chose to display the bag, given to her from St. Luke's Roosevelt Hospital, as a message about gun violence. It was hard to see it and not get choked up.